This region of the planet is not the easiest to cultivate; rocky terrain, low fertility soil, unreliable rainfall, harsh frosts and competing wildlife must be contended with. Bill and Karen's Carwoola garden works within these restrictions using elements of the garden to shield and nurture itself. A kiwifruit vine shields the orchard from the westerly wind, fruits and vegetables that become tastier after a good frost are cultivated and chooks increase the fertility of the soil and rid the garden of pests. Although the terrain is difficult, the advantage over town growers is that Bill and Karen can set their own water regulations. Of course they have to be sensible about water usage, but they are self-sufficient on a supply of rain, dam and bore water. What strikes me about this block is that it is so well organised. Bill and Karen have lived here for fifteen years and worked to balance their garden with the local growing conditions and their family’s requirements. Bill and Karen grow food using a number of traditional systems that they have successfully integrated to increase their garden’s efficiency. The orchard is enclosed and a dozen chooks roam happily amongst the fruit trees. 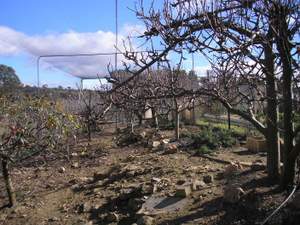 The relationship is mutually beneficial, with the trees providing dropped fruit whilst the chooks clear weeds, provide fertiliser and rid the orchard of coddling moth and other pests. The symbiosis is so balanced that Bill and Karen can go away for a week and not worry about chooks or trees, as long as water is supplied. There’s no waste here, as any kitchen scraps are fed to the chooks and straight back into the system. Bill grew up on a large cattle property so he has a skill set which includes stock management and fencing. Bill’s farming experience shows in the careful planning of the garden so that its different elements work together harmoniously to minimise the maintenance effort required. Bill's expertise also shows in cleverly designed garden features such as his portable greenhouse frame. The polypipe frame is easily covered to grow early or late tomatoes and slides into position as required along the lengthy vegetable patch. Bill's latest innovation is expandable growing screens made from star pickets and chicken wire. 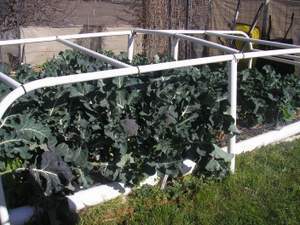 These are easily relocated for use as frames, simplifying crop rotation for climbing vegetables such as beans and snowpeas. Bill and Karen grow kiwifruit, nashi pears, a variety of apples, plums, grapes, cherries, quince, broccoli, carrots, lettuce, salad greens, cucumber, cabbage, kohlrabi, tomato, coriander and more. According to Karen it can sometimes be a challenge to find time to harvest and do something with all that produce. It’s wonderful to have a box of garden-fresh, ripe tomatoes but what do you do with all that fruit at once? Karen uses a dehydrator to store up dried tomatoes, nashi pears and plums and pickles and preserves excess produce. I was surprised at Bill’s observation that relatively few properties in this semi-rural area have their own vegetable patch. Bill’s take on this is that food growing has to be easy; he wouldn’t do it himself if it wasn’t. And it can be, if you set it up right. Bill cites Peter Cundell of ABC’s Gardening Australia as his guru, but he too has some good advice for aspiring home vegetable gardeners. Before starting it’s important to get around and speak to local people about what’s working for them in their gardens. Setting up your garden takes effort, but good planning early on will save you a lot of hard work later. It’s also important that you don’t try to do too much. Grow plants that are suitable for your region, but also that your family frequently enjoys eating. Bill adds that it’s critical in this cold climate to time your plantings with precision. Frosts must be navigated and there’s a smaller window of opportunity for good growth before cold weather sets in. For example, Bill plants broccoli in early March to get them growing well before the winter slowdown sets in. On the other side of winter he gets tomato seedlings going (in the portable greenhouse frame) during the first week of September. This way he can get them in by the rugby league grand final and guarantee tomatoes by early January. 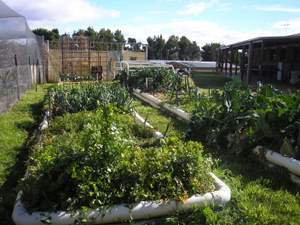 At some point Bill plans to write a growing guide for the Monaro region – his wealth of knowledge and experience would be invaluable shared with other wanna-be veggie gardeners, so we live in hope. •	Mix your fruit tree cultivars and select trees that will bear fruit staggered over the season. •	Plant two cross-pollinating fruit trees in the same hole (Duo system). 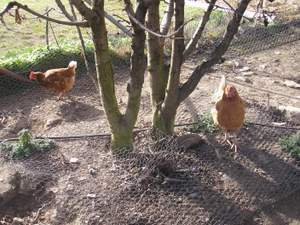 •	Lay chicken wire around the base of fruit trees to prevent scratching out by the chooks. •	Anchor the limbs of fruit trees to encourage strong lateral growth (a Peter Cundall tip). •	When growing fruit trees in an enclosed orchard, select trees that bear fruit on old wood. The size of your trees remain small and manageable, whereas trees that bear on new growth can push the boundaries of your enclosure and get out of control. •	Granny-Smith cross-pollinates all other apple trees. •	Leave Lady Williams and Granny Smith apples on the trees until they’ve been sweetened by a hard frost.